March 12th, 2017, Charlottetown – Island short track speed skaters took home overall wins, seven medals and four new provincial records from the recent Citadel Cup Short Track Championships in Halifax. Mia Stewart of Stratford nabbed one of four gold medals won by P.E.I. skaters at the Citadel Cup Short Track Championships in Halifax, N.S. recently. Photo courtesy of Phil Matusiewicz. Andrew and Peter McQuaid led the way for the Island team, as the Charlottetown siblings finished first and second respectively in division 1. Islanders also took gold medals in divisions 2, 3 and 4, with Andrew Binns winning division 2, Mia Stewart taking the gold for females in division 3 and Alex Rogers winning the top male honours in Division 4. Matthew McKenna grabbed a silver medal in division 3 and William Lyons earned bronze in division 2 to round out the P.E.I. medal haul. Four members of the Island contingent also came up with new provincial records in the 1,500 metre distance for their respective age groups. William Lyons (12 year-old boys), Andrew Binns (13 year boys), Thomas McQuaid (14 year boys) and Matt Kozma (15 year boys), all racing in division 2, each shaved time from their own P.E.I. records during the Halifax competition. The Halifax competition featured 83 skaters from ten clubs across the Maritimes and Nunavut. Connor Cameron of the host Halifax club finished third overall behind P.E.I.’s McQuaid brothers, while top female finishers were Angela Xu of St. Croix, Melanie Boulerice of Fredericton and Anny Kang of Saint John. The Maritime short track circuit will conclude with a handful of Island skaters competing in Fredericton, while a dozen P.E.I. short track skaters will move on to national and international competitions to close their seasons. 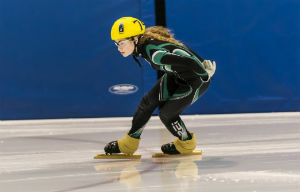 The Canada East Short Track Championships, being hosted in Ottawa later this month, will see eight skaters flying the Island flag, while a trio of Islanders will compete at the Canadian Junior Selections #2 in Trois Rivieres, Q.C. and P.E.I. team member Rob Binns will be part of Canada’s contingent at the Masters International Short Track Games in Sheffield, England in early April.